for the King of the Hammers event. The U.S. Marines Corps is moving forward with plans to expand its base at Twentynine Palms, California, and take ownership of nearly 147,000 acres of the adjacent Johnson Valley OHV Recreation Area. The Marines intend to conduct large-scale training exercises during two months of the year. Nearly 104,000 acres of Johnson Valley would be permanently closed to off-roading. Another 43,000 acres, including the unique terrain known as “Hammers,” would be available for dual-use purposes. However, this land could be closed in the future since munitions from live-fire training could make the area unsafe for recreational access. The land is currently managed by the U.S. Bureau of Land Management (BLM). The OHV community is urging the Marines to obtain special-use permits from the BLM and have no live-fire training. The Marines were directed by congress earlier this year to deliver a study by April 2 detailing how they would share the land with the OHV community. The Marines have already responded by submitting their “record of decision” to the House Armed Service Committee indicating no change of plans. The Marines will ask Congress to approve a transfer of the BLM land within the upcoming 2014 National Defense Authorization Act. The Marines’ decision comes days after an estimated 60,000 enthusiasts and participants attended the 7th annual “King of the Hammers” in early February. 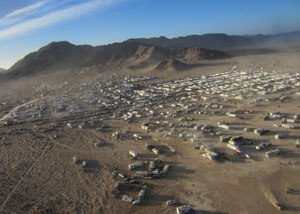 It is the largest off-roading event held in Johnson Valley. SEMA is working with the Off-Road Business Association (ORBA) and a coalition of other land-use advocacy organizations to ensure the land remains open to organized and individual OHV pursuits. Congressman Paul Cook (R-CA), who represents both Johnson Valley and Twentynine Palms in the U.S. Congress, attended the “King of the Hammers” event. Rep. Cook met with race organizers, participants, vendors and attendees to learn more about the economic impact of off-road activities in his district. Cook also addressed a standing-room-only crowd at the drivers’ meeting to share thoughts on his experience at Johnson Valley. The OHV community has petitioned the White House for support of the special-use permit approach. Thanks in part to SEMA and its SEMA Action Network (SAN), more than 25,000 signatures required for an official administration response were received in just two weeks. The community is now awaiting a White House response. SEMA/SAN will continue to lobby Congress for continued BLM ownership of the land and issuance of special-use permits to the Marines, with no live-fire training.